In Massachusetts, if you have been injured by a negligent driver, you may be able to obtain financial compensation. You may also be able to seek compensation if a family member has suffered a wrongful death in an accident. It is important to seek immediate medical treatment and a legal consultation with a Boston bicycle accident lawyer to determine your rights. Bicyclists are at a disadvantage on the roads. Motor vehicle drivers often do not watch out for them or understand the cyclist's rights under the law. When there is an accident, the bicyclist can be expected to sustain the more severe injuries, which can result in substantial medical bills and time away from work. Bellotti Law Group, P.C. has been successfully representing injured cyclists in Massachusetts for more than 20 years. We are experienced at making your case to insurance companies so you can focus on recovering from your injuries. If you have been injured in Boston or beyond, the bicycle accident lawyers at Bellotti Law Group, P.C. can help you determine your rights. Our offices are conveniently located in Boston, Cambridge and Quincy. Contact us today at 617-225-2100 to discuss your personal injury claim. Bicycling has greatly increased in popularity in recent years in Massachusetts, a combination of government efforts and a desire among the public to avoid traffic congestion and support environmental-friendly efforts. Recently, the League of American Bicyclists named Massachusetts the third most "Bicycle Friendly State." In Massachusetts, cyclists are allowed to travel anywhere motor vehicles can. Some communities offer some bike lanes or sharrows (shared lanes), while in others, cyclists travel along the right side of the road or in the traffic lane. Cities with substantial cycling populations include Boston, Cambridge and Somerville, but in recent years, many suburbs have increased cycling opportunities by developing off-road bike paths. Some of these trails include the Cape Cod Rail Trail, the Upper Charles River Trail in Milford and the Assabet River Rail Trail in the Marlborough area. Massachusetts cyclists have all the same rights as motorists, with a few differences. Some of the basic ones concern where a cyclist can travel and how drivers can pass them. Cyclists can travel in the middle of the roadway, along the side of the road or two abreast in the middle of the roadway. They are not permitted to travel on sidewalks in downtown areas. Outside that area, local communities decide. At intersections, automobiles should yield to turning bicycles. Cyclists are allowed to pass traffic on the right, but motor vehicles cannot. Motor vehicles must also have sufficient space to pass a cyclist traveling in the same lane. Boston: Bicyclists can be found throughout Boston in all the same areas as motor vehicle traffic, including the Fenway, Beacon Hill, Government Center, Back Bay, the South End, North End and Jamaica Plain. Two areas with the most bike accidents are Massachusetts and Commonwealth avenues and Commonwealth and Brighton avenues. Quincy: With over 88,000 residents, tourism sites and many large employers, Quincy is a city where people are always on the move, by car, bus and bicycle or on foot. On Hancock Street downtown, bicyclists pedal to work, historic sites and Quincy College, which serves students throughout the South Shore. In areas like Wollaston Beach and Quincy Shore Drive, bicyclists pedal for pleasure. Still more bicyclists are traveling from home to local stores and restaurants in city neighborhoods such as Squantum, North Quincy, Merrymount and Marina Bay. Cambridge: Cambridge can be both an enjoyable and dangerous place for a bicyclist. The enjoyable areas include Memorial Drive, where a cyclist can ride along a path on the Charles River and take in scenes of the MIT campus and Boston's skyline. The high-volume traffic zones are more difficult. Massachusetts law bans bicyclists from riding on the sidewalks in business districts. Cambridge police strongly enforce that ban in the Central and Harvard Square business districts as well as several other areas. Cyclists must walk their bicycles through the business district, ride on the street or take another route. We also have helped clients in the Somerville area. There is a risk for Somerville bicycle accidents on busy bike paths and congested roads. In 2009, Inman Square in Somerville and Cambridge was ranked the leading area for bicycle accidents in Massachusetts, according to the state Department of Transportation. Porter Square ranked third worst for bicycle accidents, while Davis Square was listed as the sixth worst area for pedestrian crashes. Wherever you are located or were injured in the Boston area, we can help you secure compensation for your injuries. Bike accidents can happen for a number of reasons, including a bicyclist's own error, defective roadways or a driver's negligence. Drivers can operate negligently by speeding, tailgating, failing to stop at traffic lights or stop signs, operating under the influence of alcohol or drugs, texting while driving, talking on a cellphone and other reasons. Injuries can occur on the road, but also when cars back into parking spaces or occupants open the door without looking and strike bicyclists, a practice known as "dooring." 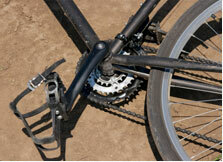 Speak to a Boston bicycle accident attorney if you were in a bicycle accident. You may have serious injuries, including broken bones, a concussion or internal injuries. Even if your injuries are not visible, it is important to seek medical treatment immediately. If you are involved in a bicycle accident resulting in over $100 in damage or personal injury, you must report it to the local police department. You can do this on your own, or contact an experienced bike accident lawyer to help you. If you have been injured by a motorist, Massachusetts law provides you up to $8,000 in personal injury protection (PIP) benefits for medical bills and lost wages. If the driver was negligent, you may be entitled to additional damages. It is important to learn your rights because you may be unable to work for a period of time. The Massachusetts lawyers at Bellotti Law Group, P.C. can help you determine your rights. Contact us today at 617-225-2100 or use our online contact form.